In the world of Remnant, Ruby Rose and her teammates Weiss, Blake, and Yang study to become Huntresses at the Beacon Academy in the city of Vale. (The final episode of Season 3 came out this week. There will be spoilers below. Each season is only about 2 hours long, so you probably want to catch up before entering the thread). 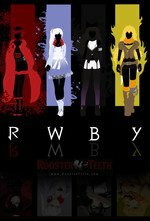 The series is produced by Rooster Teeth, and was created by the late Monty Oum.